Asphalt concrete pavement is used in either SMA or Superpave Pavement Technology，the shape and rank of aggregate has been brought up a very high demand. Especially to the content of needle plate type in the basalt, the former impact crusher processing chart cannot meet the requirement any longer. Therefore, our company puts up the newest crushing and screening processing chart-VI series of Vertical Shaft Impact Crusher to meet the need. 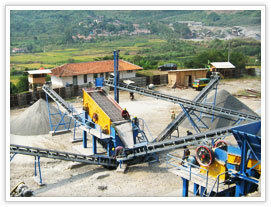 The high-quality aggregate produced by this production line is widely used in road surface of many highways. 1. The quality of the product is very high. Content of needle plate type is no more than 5%. A diabase in Africa, once adopted Jaw Crusher and Impact Crusher. But content of needle plate type is more than 10%, resulting the bad sell of its product. After using VSI Series Vertical Shaft Impact Crushers, the content of needle plate type in the product is reduced to 4.7%. 2. The production improves 50% compared with useing Impact Crusher as the final processing of crushing. 3. Because we use Impact Crusher as the secondary crusher, and Vertical Shaft Impact Crusher consumes little metal, the consumption of wear-parts is reduced greatly in the whole process.